A panoramic view of the Osaka Central Wholesale Market in Osaka, which played a major role in establishing a stable food market in Osaka and surroundings. Until the early Showa Period (1926-1989), Osaka’s food markets were located near important waterways and roads. Especially popular were the markets in Tenma, Zakoba, Utsubo, Kizu and Namba. The violent Rice Riots of 1918 (米騒動) when rice prices rose beyond many people’s ability to afford this staple food would end these age-old street markets. Police stations, government offices and the businesses of rice dealers were burned down, while there were a multitude of armed clashes between rioters and police. Started in Toyama Prefecture on July 23, more than 600 disturbances had occurred all over Japan by mid-September. The consequences were great. Some 25,000 people were arrested, Prime Minister Masatake Terauchi (1852-1919) and his cabinet resigned and rice production in Japan’s colonies of Taiwan and Korea was intensified. Additionally, in order to bring stability to the markets, standardization of trading practices and price regulation was introduced. 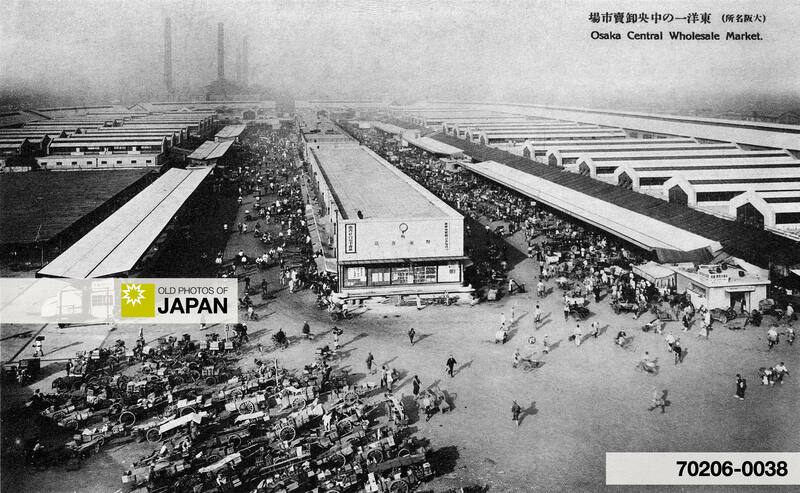 The Central Wholesale Market Law was enacted in 1923, and research was done in Osaka to find the best location for such a market. Noda in Fukushima Ward was selected and in November 1931, the Osaka Municipal Central Wholesale Market was opened, replacing the centuries-old street markets. 1 Osaka City. The History of the Osaka Municipal Wholesale Markets. Retrieved on 15-06-2008. You can also licence this image online: 70206-0038 @ MeijiShowa.com.